Toys that mimic body functions and fluids have enjoyed popular – albeit sometimes controversial – acclaim over the years. Doggie Doo, fake vomit, and whoopee cushions are all examples. 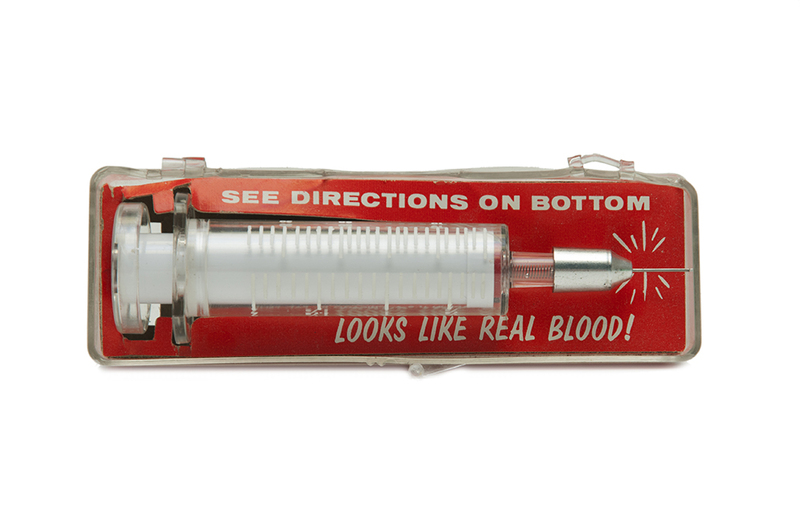 So is the Hypo-Phony – a fake hypodermic needle released in 1958 by Chicago-based H. Fishlove & Co. 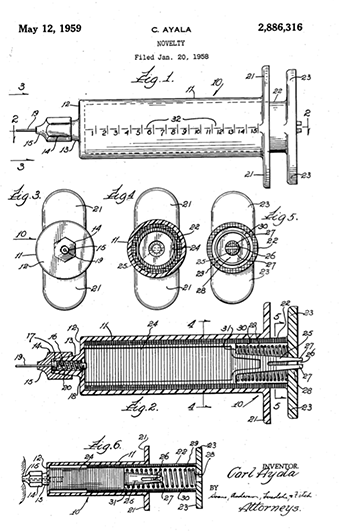 The toy’s realistic-looking plunger, finger flange, barrel, and needle tip allowed pranksters to appear to draw or give blood. 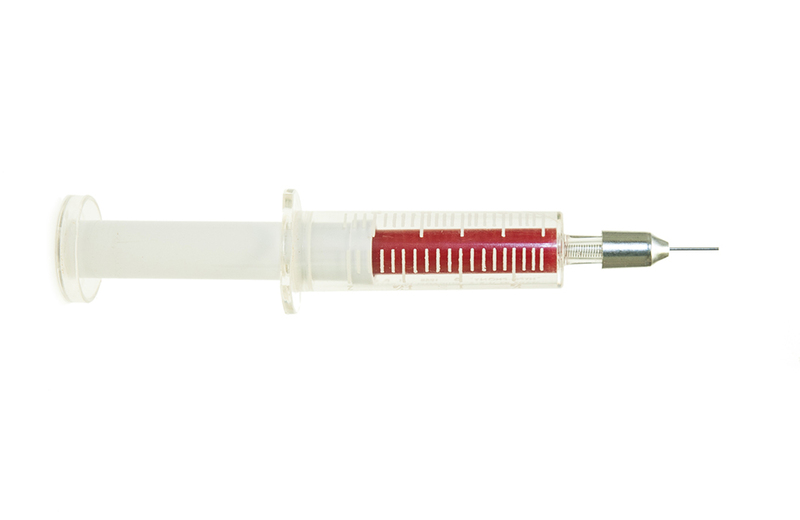 The Hypo-Phony’s blunt needle seemed to penetrate the skin by retracting inside the hypo. A button on the base activated a red-coloured cylinder and gave the illusion that blood was being drawn or injected. 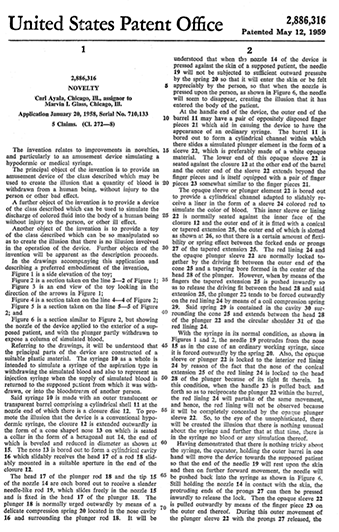 United States Patent #2,886,316, filed January 20, 1958, on behalf of inventor Carl Ayala and assigned to legendary toy design company Marvin Glass & Associates, highlights the design and optical illusion of the Hypo-Phony. Needless to say, not everyone has bought into the toy’s purported play value. Over the years, the Hypo-Phony has been an easy target for critics of its medicinal-based humor. In 1985, H. Fishlove & Co. was acquired by Fun Inc. The Wheeling, Illinois-based company calls itself America’s Magic and Gag Novelty Factory and continues to sell the Hypo-Phony to this day, along with other novelty items gained through the acquisition. Speaking of novelty items, if you’re interested in more of the history behind classic novelty items, we recommend Cheap Laffs: The Art of the Novelty Item from author Mark Newgarden. To celebrate World Monopoly Day, here are 8 fun facts about the game.